So what is a ‘push ring’ (or ‘push present’, as it’s known in the US)? Basically, it’s a gift from new dads to their partners to mark the occasion – and the effort involved – of giving birth. In the past, this was known as a baby ring. The ring will usually have diamonds and/or coloured gemstones, and is often the colour of pink or blue, depending on the gender of your child. The ring might have some personalised engraving which would usually be the birth date or name of the baby. Other than engagement and wedding rings, wedding anniversaries, significant birthdays or job promotions are the main reasons people choose to celebrate with a gift to their partner or to themselves. While I do remember thinking that ‘push ring’ sounded a bit wrong, it seems to be a common term these days. I still prefer the word ‘baby ring’, however: people’s birth stories are very personal and I don’t want to offend anyone by labelling the occasion with a predetermined expectation on how the baby was delivered. 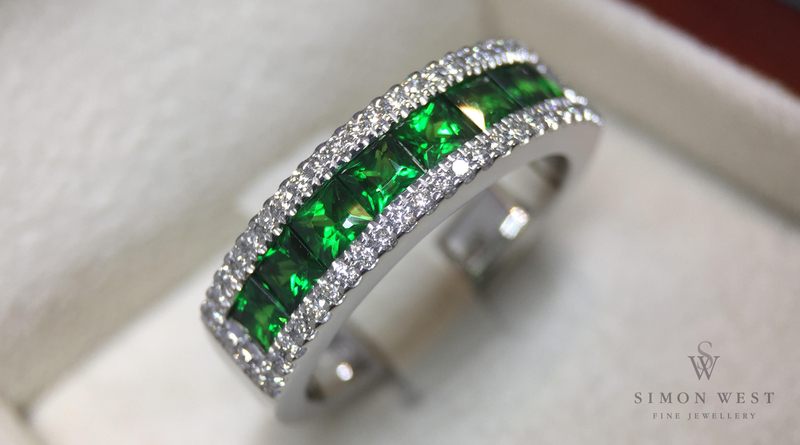 Green square Tsavorites with small diamonds. Made by hand in 18ct white gold. Around 30 per cent (and counting) of the customers who purchase their wedding and engagement rings through me come back for a push ring. Usually the husband or partner prefers to do it as a surprise after a few hints from their partner. Bouncing baby aside, it’s a reward for a job well done. Simon West is a Melbourne-based bespoke jeweller who specialises in engagement and wedding (and, naturally, ‘push’) rings.